In developing the NEPA Philharmonic site one of the client requests was a subsite for children and teachers called the 'Kids Corner'. The information in this area includes concerts for children, educational information for teachers, and games. 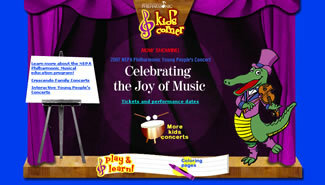 The NEPA Philharmonic's mascot Crescendo the crocodile is the host of the area. The Kids Corner was designed with a different look from the main site more suitable to younger visitors. The games created for the Kids Corner were developed in Macromedia Flash.